With the 2016 Summer Rio Olympics opening ceremony having just taken place, it is indeed an opportune time to learn how athletes are increasingly using technology to up their game and performance! Sports technology, particularly – data analytics – has taken great strides recently and is making an impact on all kinds of sports. Technology is being used in several aspects of sports — from training, performance and fan engagement to marketing and broadcast — in various forms that include analytics, smart equipment and decision-making technologies. 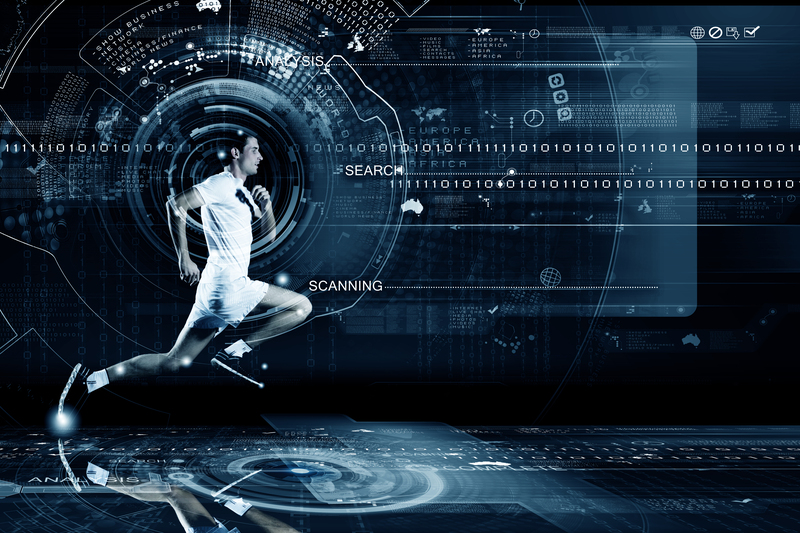 Technology not only enables in-depth analysis of the game and athlete’s performance, but it also helps decision-making by capturing exhaustive athlete, equipment, and game-related data, and produce detailed metrics that augment such analysis. While adoption of analytics in sports is among the top priorities, trends such as sensor-based tracking of player performance, fan engagement, digital marketing, and decision-making technologies in sports, are also catching up. Both start-ups as well as large sports technology companies have introduced innovative solutions that cater to the technological needs of various sports. 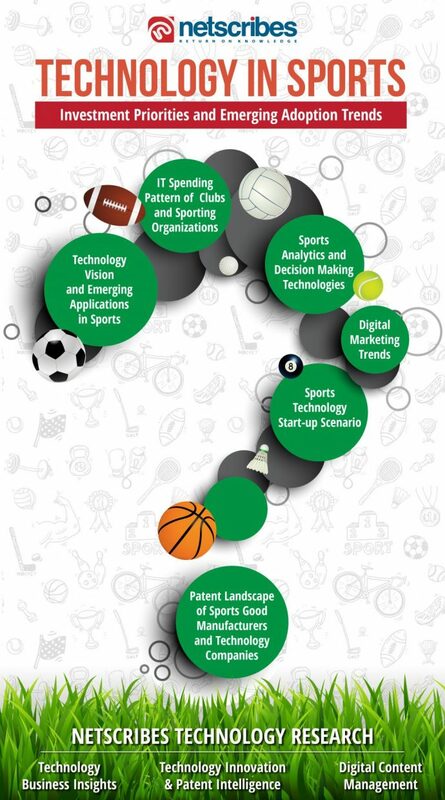 Netscribes’ latest report titled ‘Technology in Sports: Investment Priorities and Emerging Adoption Trends’ delves deep into this space and provides a thorough understanding of usage of technology in different sports across its varied spectrums. A significant portion of this report is based on Netscribes’ ‘Global Technology Leadership Survey’ that has captured detailed information and trends regarding investment priorities and emerging adoption trends w.r.t. the usage of technology in sports. The report captures and analyzes the globally prominent ICT solution providers in detail, and their offerings in the field of sports – leading to a comparative analysis, benchmarking and ranking. It also discusses in detail how emerging start-ups are playing a key role in terms of innovation in the related space, and goes on to provide insights about their specific innovations/offerings. The patent analysis section of the report analyzes the patent landscape vis-à-vis sports technology. It examines 500+ relevant patent families’ belonging to categories such as decision making tool/technologies, performance analytics, sensor systems, simulation/training, sports analytics and tracking system/method. Identifying the top 10 companies based on the highest number of relevant patent filing over the last 10 years, this section goes on to discuss company-wise patents by category and their status, in the form of being active, inactive or pending. It also provides an insightful analysis of the patent landscape from a perspective of the top 10 companies as well as individual patent filers. The technology research team at Nestcribes constitutes of experienced technology research analysts, who provide technology business insights that help technology companies understand their potential market, track competitors and get in-depth information about prospects. Netscribes’ comprehensive research coverage, actionable insights and strategic recommendations support their sales & marketing decision makers and leadership teams developing their go-to market strategy and winning new deals across the globe. While the major focus is market intelligence, competitive intelligence, account intelligence (for deep-dive prospect analysis) reports, the team is also engaged in specific custom research. The patent research team at Netscribes is engaged in technology innovation & patent intelligence research that includes patent drafting services, technology analytics services, patent analysis & search services, licensing support and technology commercialization support services. Netscribes also provides content marketing solutions, digital asset management services, online reputation management and marketing collateral support for IT organizations looking to align their content strategy to their business objectives.